This page is for the 2002 game. For the enhanced edition, see Neverwinter Nights: Enhanced Edition. 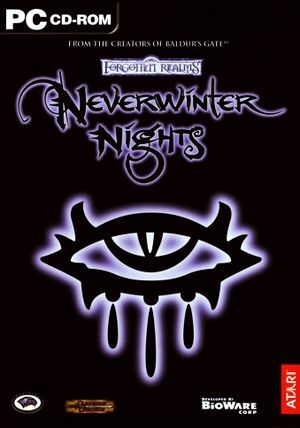 For the 1991 game, see Neverwinter Nights (1991). Premium Modules from the BioWare Store require an internet connection at launch but the authentication server has been shut down; use Premium Module Offline Authenticator Generator. Bundled with Neverwinter Nights: Enhanced Edition. Includes the Shadows of Undrentide, Hordes of the Underdark and Kingmaker expansions. There is no complete edition of this game; the Diamond Edition is the most complete. The Linux version did not release in a boxed format. Premium Modules from the BioWare Store require an internet connection at launch but the authentication server has been shut down; use Premium Module Offline Authenticator Generator. Diamond Edition modules do not require this. BioWare Store DLC is not available on OS X. Sold as an expansion or in compilations (Platinum, Gold, Legends, 3-Pack). Sold as an expansion or in compilations (Platinum, Legends, 3-Pack). Included in compilations (Platinum, Kingmaker). Previously sold on the BioWare Store. No longer sold (only available from the BioWare Store). NWN Critical Rebuild 1.69 updates the game to the latest version. The GOG.com version indicates it is patched to 1.69 but often has issues which the actual 1.69 Critical Rebuild will fix. The NWN Community Patch is a collection of miscellaneous tweaks/fixes/adjustments above and beyond the official 1.69 patch. It mainly aims to fix various small mistakes that persist in the game even past the final official patch, so it can be suggested (though isn't absolutely necessary) for anyone. Many of the fixes work on their own with the base game, and as such do not require any additional modules/addons to see a benefit, though there are many usability adjustments that help with extended modules. The Community Enhancement Pack adds a wide variety of new items, clothing, and features, such as rideable creatures. Note that these are mostly used for building new modules/content, or used in conjunction with downloaded fan-made modules that require this content. As such, there is little if any reason to download and install this pack if you aren't interested in expanded modules. As of 3/29/2018, the latest version is 2.65 and is available here. Not natively implemented; see here if save files disappear. Running the game in windowed mode may make the game work significantly better. Open nwn.ini in the installation folder. Toggling windowed mode with Alt+↵ Enter may crash the game or cause other strange results. Sound Effects, Voices and Music. Up to 7.1. DirectSound 3D restoration software may be necessary to prevent stuttering. A3D 1.0 and 2.0. EAX 1 - 3. Online play requires a CD key; for the GOG.com version see Multiplayer on the GOG.com version. GameSpy master server is offline; see Online play. Use Direct Connect button or +connect and +password parameters. The GameSpy master server is offline. NWNCore Mastering Service replaces GameSpy with a player-run master server. Try the following if the game won't start for some reason, or crashes shortly afterwards. Make a shortcut to nwmain.exe somewhere convenient. Add the following to the end of the Target: +TestNewModule "123456"
Click OK and use this shortcut to run the game. Alternative: If the above does not work in XP SP3, making a copy of nwmain.exe in the installation folder and renaming it to something else may work (make a new shortcut or modify the existing one to target the new copy). When you initially download Neverwinter Nights Diamond from GOG.com, it does not initially support multiplayer as it does not come with a valid multiplayer CD key. The 2nd December 2016 Update includes the CDKey Changer Tool. Follow the steps to replace the default product keys with the unique ones listed on the My Account page. Run the "premium modules re-installer" from the My Games bonus content to restore access to the premium modules. 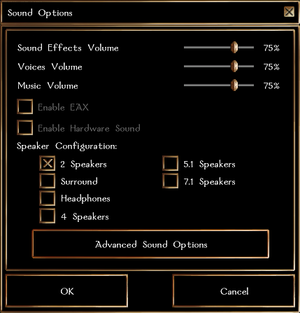 Neverwinter Nights does not run well on modern hardware and systems, and you may experience crashes or stuttering without properly preparing your game. Here are a list of fixes you may want to try. These were all tested on Windows 7 64-bit but may work for other systems. Make sure that NWN is not in the C:\Program Files (x86) folder as there may be a problem with permissions. Instead try installing it to its own folder, like C:\Games\NWN. You may have to set the compatibility setting of nwmain.exe to Windows XP SP2 or SP3. If that doesn't work, you might try this (for ATI cards only). Download this dll. Open your nwn folder. Rename the file binkw32.dll that is in your nwn folder to binkw32_ati.dll (don't just append .BAK or something because the new dll makes a call for this dll). Place the newly downloaded binkw32.dll from mediafire in the folder. If you've changed SafeMovie, open nwn.ini and make sure SafeMovie is set to 0. This might not work. NWN was not meant to run with more than one core. If you have a multi-core system, you can set the game to run on only one core. Open Task Manager with NWN open, rightclick nwmain.exe, Set Affinity on one core. If it gives you an error, click the button "Show Processes from All Users" at the bottom. You can experiment to see which core gives you the best performance. To avoid having to do this every time you play the game, open nwnplayer.ini in the main NWN folder. Locate Client CPU Affinity and change the value to 1 (or whatever other core you determined gave you the best performance in the first step). For some reason there may be an issue rendering cloaks and bowstrings that causes low frame rates. To disable cloak graphics, open nwnplayer.ini in your main NWN folder and locate Visible Cloaks. Change the value from 1 to 0. To disable bowstrings, google for a patch. You may find increased performance by disabling/turning down the Catalyst AI in your Catalyst Control Panel's 3D settings. In the newer VISION Engine Control Center, this can be accomplished in the advanced view by creating a new profile for nwmain.exe under Gaming - 3D Application Settings, then, under Texture Filtering, setting "Texture Filtering Quality" to "Performance" and "Surface Format Optimization" to "Off." For some reason this may make your character disappear. 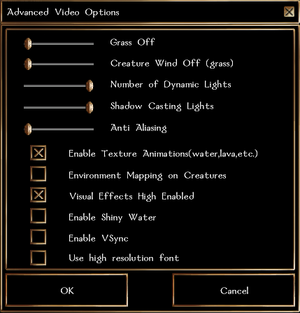 To make your character reappear, go into the ingame video options and disable Environment Mapping on Creatures. Right click nwmain.exe and go to Compatibility. You should be running the game in an XP compatibility mode and with Disable Desktop Composition checked. Disable Visual Themes might be helpful as well. Disable "Shiny Water" from the video settings in game, should definitely increase performance. NWN may have issues with sound. Disabling sound outright may significantly reduce stuttering. You can disable sound completely in nwconfig.exe. If you don't want to go that far, experiment with the sound providers in the ingame options. For most modern computers, the options in the video settings have negligible effect on performance. A high level of Dynamic Lighting, though, may lag your system when many dynamic lights are created (many magic spells create dynamic lights). Increasing the process's priority positively effects frame rates. You can do this by opening Task Manager, right clicking nwmain.exe, and setting Priority to at least Above Normal. The original BioWare Store has been shut down. Previous owners can still download the Premium Modules manually. Use the Zip links for Linux; either will work for Windows. GameSpy GameSpy has been shut down; see Online play for alternatives. 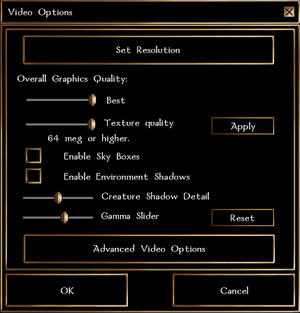 ↑ 2.0 2.1 Neverwinter Nights premium modules--net connection required? This page was last edited on 18 April 2019, at 01:34.